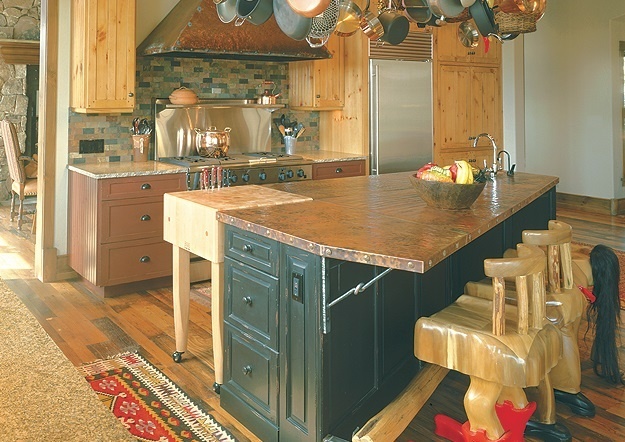 Traditional style kitchens are inviting, warm and beckon to be enjoyed. 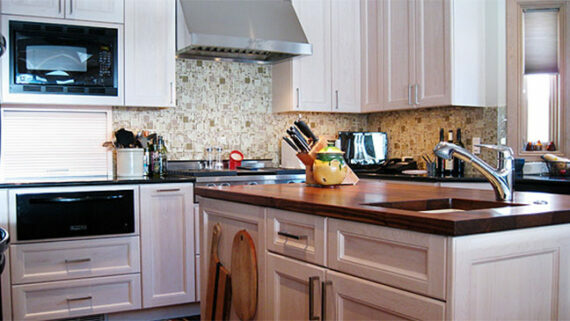 To be specific, this type of kitchen has an eclectic mix of fabrics and patterns. Large windows work well with this design to make the room appear brighter and give more of an outdoor feeling to the space. Many of these kitchens include a breakfast nook to bring in plenty of natural light and greenery from the outdoors. Traditional kitchens tend to lean towards natural, warm, earthy colors, such as: white, off white, tan, brown, and light gray. Sometimes, other colors such as deep red or yellow are also used. As long as you keep in mind that the focus in on bringing the outdoors inside your home, you should be able to find a color scheme that will work for your kitchen. Better Homes And Gardens recommends incorporating your favorite personal trinkets and dishes inside glass front cabinets or strategically placed throughout the kitchen. Doing so, will add color and interest to the area. Fabric pieces, such as draperies or napkins can feature your favorite floral or other natural style pattern. Stay away from bold, geometric patterns, as those tend to look modern and will take away from the traditional feel you are trying to convey. Any modern style furniture which is in the kitchen should be removed. A streamlined, contemporary appearance doesn’t promote a traditional feel to the room. Opt instead to include cabinets, counter tops and furniture that have more curves and detail. Crown molding and ornate carved wood furniture, will set the tone for the space and make the room feel much more cozy. Smaller details in the kitchen, such as cabinet handles, drawer pulls, light fixtures and faucets should feature detail and create interest. You also want to avoid streamlined pieces in these areas as well. Avoid a monochromatic look by mixing up the cabinet colors. Center islands will often feature a different color cabinet than the rest of the room. Another option is to give the island a different counter top than the perimeter counters. Elements that are made of laminate, veneer or lacquer should be avoided and removed. These materials will make the room appear modern and not as cozy as a traditional style kitchen. An article from HGTV suggests combining different natural materials, such as wood, brick, stone and granite for a handcrafted appearance. When laying the tile, stone or brick on the kitchen floor, develop a pattern that will make it look more interesting and detailed. This will add adding texture and color while keeping with the overall traditional theme. 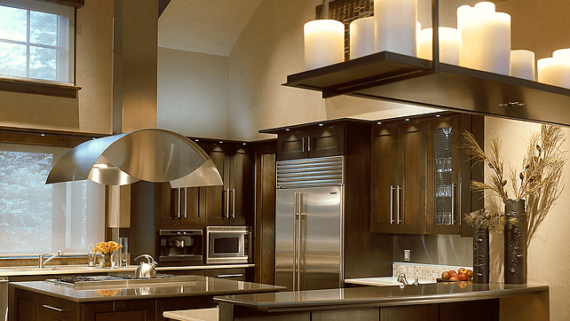 Creating the kitchen of your dreams is always at the top of the list when remodeling or building a new home. Taking the ideas mentioned above and combining them with your individual style will give your space a unique look that stands out from the rest. Combining textures and colors from the outdoors, along with a lot of natural light brings the traditional kitchen to life. To determine if traditional style completely suits your personal taste, speak with an experienced designer, who is knowledgeable about the various components to bring your vision to life. You may find that they have suggestions that you have not considered. For further reading, check out: How To Add Unique Texture To Your New Kitchen and How To Pick The Best Backspash For Your Kitchen.